A little late, but maybe not late enough to materially affect next year’s harvest. 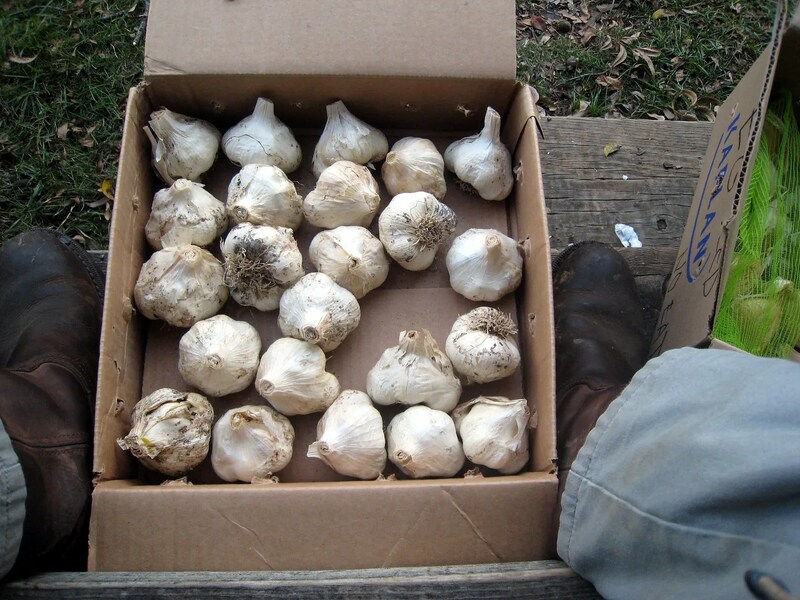 In June, I set aside the largest heads of the silverskin or softneck garlic that invaded my backyard with last year. 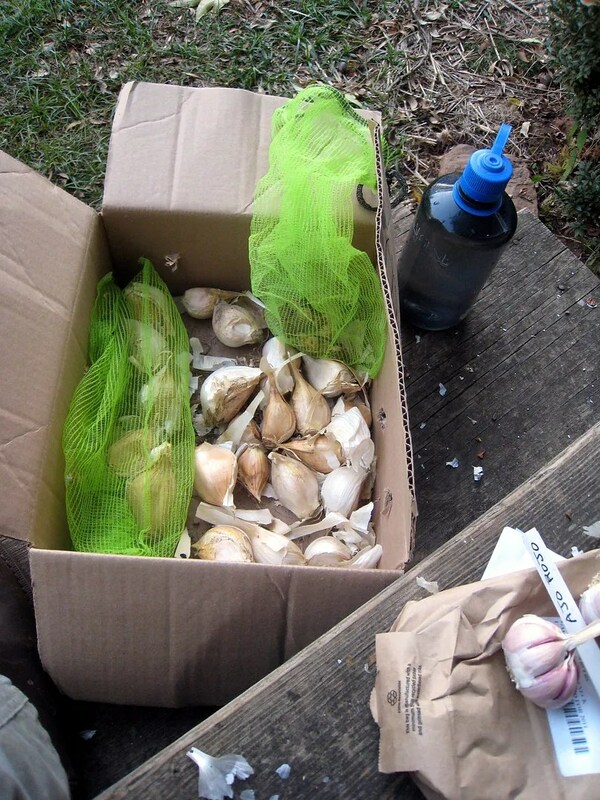 The method for consistently good long term garlic harvests is to save the best of the crop as seed for the next season, and and once you have the luxury of “bounty”, to only use the largest cloves off of the largest heads. Each generation in theory (and actually in practice as well) is more suited for the micro environment of your garden and the yield increases over time. Sort of a backyard Darwinian lab eh? While I was at it, I pulled the elephant garlic stock as well. The cloves are so large that it would be expensive to buy any meaningful amount of seed stock at once; it seems like last year my $13 lb of EG seed only provided 5 or 6 cloves. My cheapness won and I held back the entire crop for seed this year- a little over 20 large cloves I think (duh, I didn’t count before I planted). As a bonus I have about the same number of the little “bulbils” or “bulblets”, which are about the size of a large clove of normal garlic. These will each grow into a full head of EG, but it takes 2 seasons to take place (more on these later). Finally, I also prepared my only purchased seed garlic for the season, 3 heads of “Ajo Rojo”. I’m hoping the Ajo Rojo lives up to my expectations. It is a “creole” garlic, an oddity of sorts because it looks and tastes more like a hardneck variety, but thrives in much warmer climates than is typical for hardnecks. The source of the creoles was southern Spain; slowly they are catching on here and sufficient seed stock is becoming available to hobby gardeners like me. The hardneck varieties tend to have more distinct “gourmet” flavors vs the soft or silverskin varieties. The fiery hot varieties are mostly hardneck; the issue for me is that hardnecks tend to favor much cooler climates where days are shorter and the number of cooling hours in a season are higher than can be expected in N GA.
As you can see in the picture below, these look nothing like the white silverskin garlic you see in the local grocery store (and so far in Cohutt’s garden ;). Note that there are no smaller central or interior cloves; all cloves run from the center scape stalk (hence the “hard” neck) to the outside of the bulb. They do have the typical paper skin of “regular” garlic but I removed it for the picture and in preparation for planting. These three modest heads were almost $5 each. 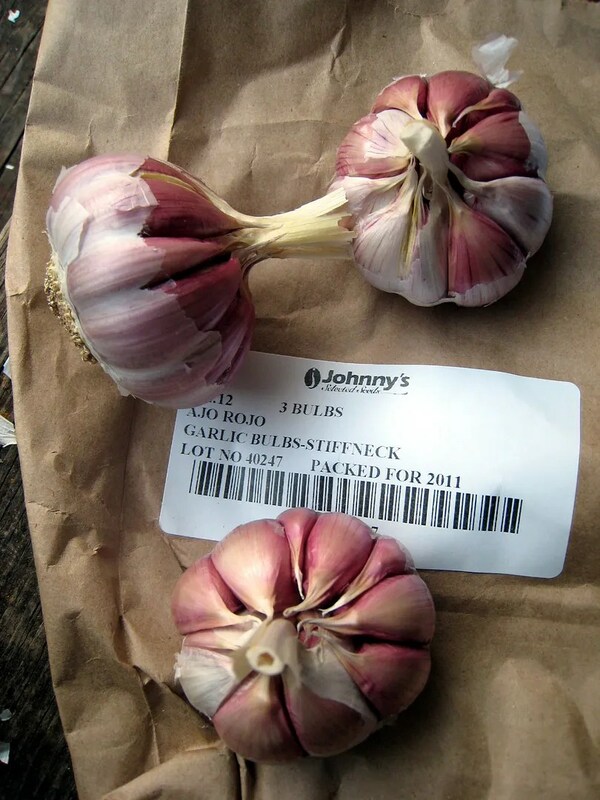 The softneck garlic (“California Early” I think) purchased last year was only $4.00/lb or about $.50/head. I moved the smaller bed (3′ x 3′) that served as host to last summer’s cucumbers into the open corner of the hoop house and have planted the best Ajo Rojo in it. I have read that a little bit of cover can make a significant difference in the size and quality of garlic, so the expensive creole seed is this year’s officially pampered greenhouse garlic. That Creole garlic is gorgeous. So since it has the central stalk, will it grow scapes? Have you ever grown hardneck? Ever have scapes? We love them, that’s why I’m growing just hardneck this year. I don’t know; there is a lot of conflicting information on the creoles. I have some hardneck stock I traded with Spartan @ TSPF for some cast bullets. This will be the third generation i’m planting this year. It has been “ok” but I think I’m too far south for whatever variety it is.